Oh my gosh, this weather!! After 2 weeks of rain in Victoria, it seems we're finally having a taste of spring and a hint of summer. The day the clouds broke we ventured out to celebrate the sun by doing Samantha and Chris' engagement photos at Lone Tree Hill. Not only did we have unbelievable light, accompanied by stunning views, but we had great time chatting and exploring with Sam and Chris. It was refreshing to watch their lighthearted, silly, authentic connection as they romped around the hill and cliff edges, flirting and laughing the whole time. It all felt so very summer! 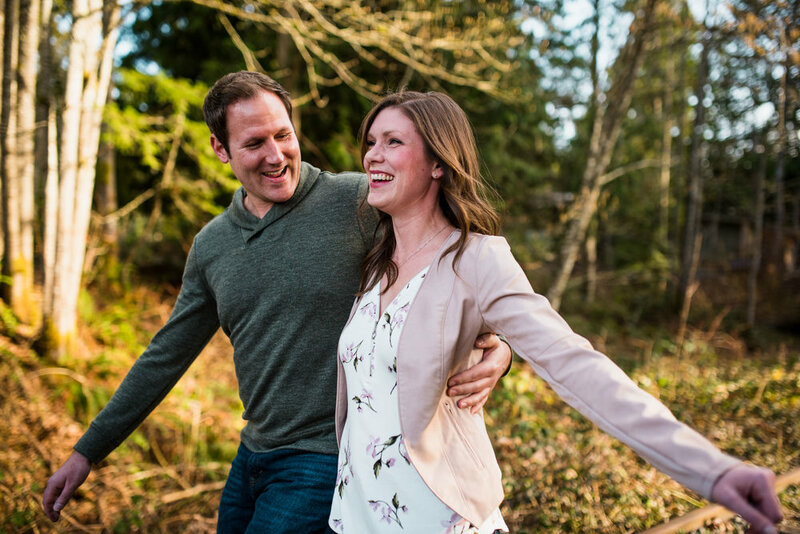 We can't wait to watch how much fun these two are going to have during their Saanich wedding in June! 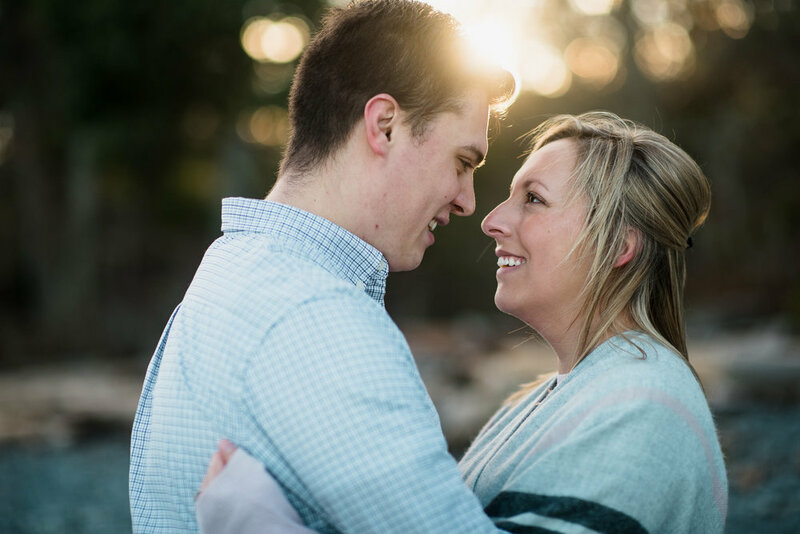 Jessica and Jordan have a busy few months ahead of them as they plan their Mount Washington wedding from their home in Calgary. 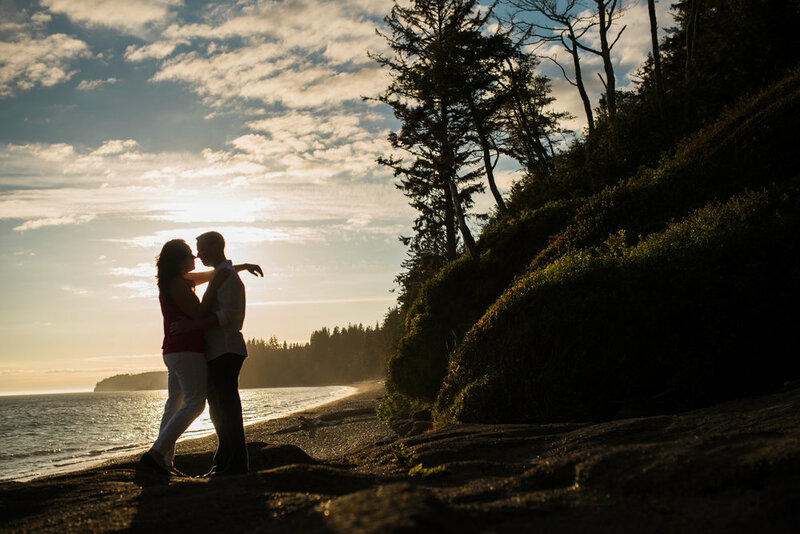 That's why we were so excited when they let us know they'd be on Vancouver Island visiting family, and that they'd have some time to meet up with us to do some engagement photos! 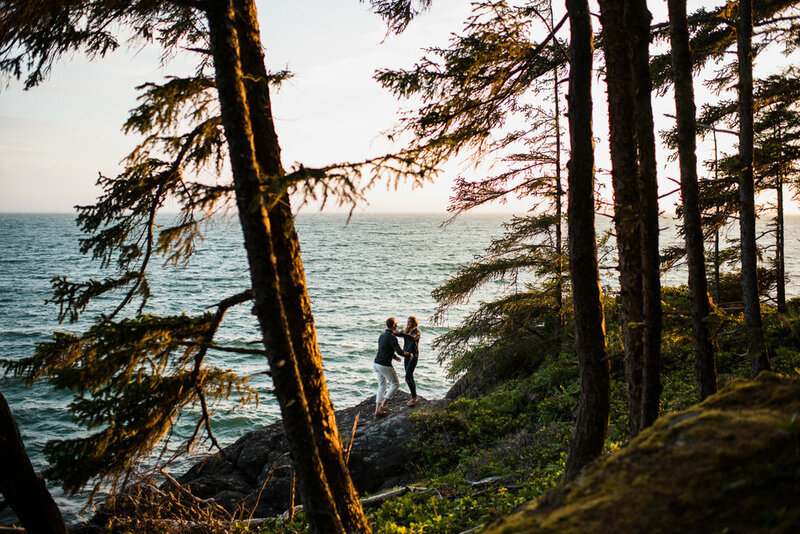 When they said they liked places that would fit their love for the west coast forests, and the beaches, we knew a place that would tick all the boxes! Tall evergreens? Check. Tangly, mossy garry oaks? Check. Beautiful beach? Check! For a little added bonus, we had the whole place to ourselves which is always great when photographing an engagement or a wedding. 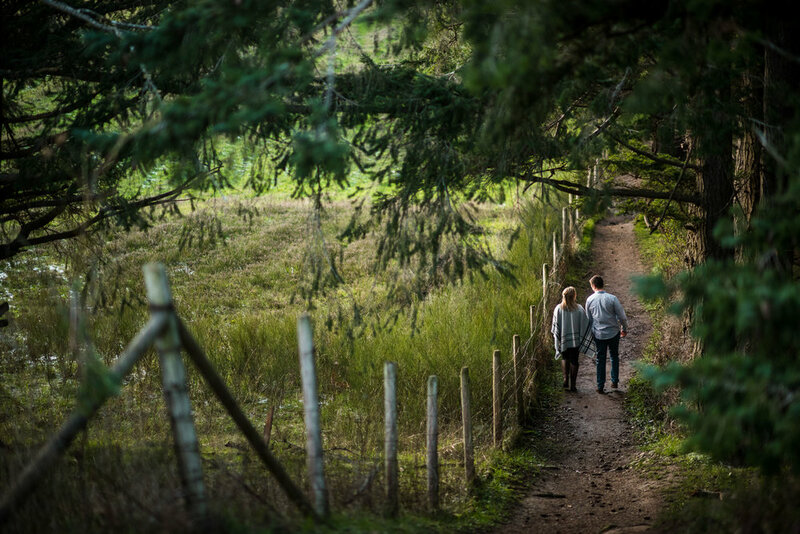 We always love to photograph couples in places they love, doing things they love, but we also have a blast when we get to tell people about a cool place that they've never been before. We had so much fun taking Jessica and Jordan through the trails to explore the beaches and rock formations. 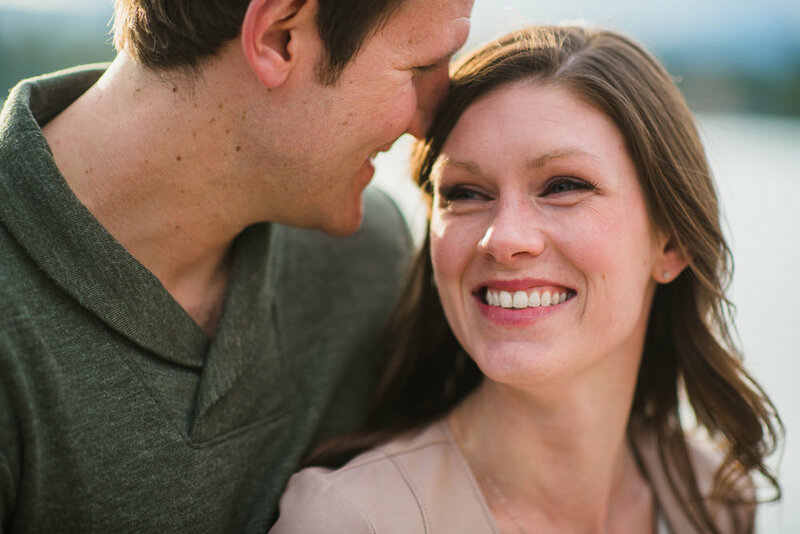 Thanks Jessica and Jordan, we can't wait to see you again at your Mount Washington wedding! More great wedding and engagements! One of our favourite goals we've made over the past couple years is to do a lot of island hopping of the Gulf Islands, for fun and for work so we can explore more of island life. 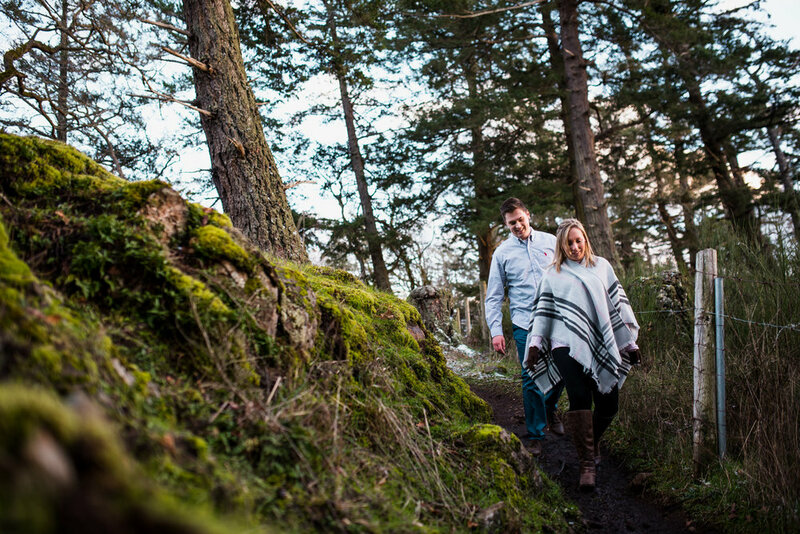 We've seen and photographed weddings and engagements on Salt Spring, Thetis, Galiano, and now Pender, thanks to Hilary and Chris who invited us there to their cabin to explore and do their engagement photos. We couldn't wait! We met Hilary and Chris at their cabin on Magic Lake, which really was magical! The crisp air, shining sun, lime green willow buds, and lakeside cabin had made us feel right at home and dreaming of spring! After hanging out on the dock with their pup, Lazlo, and cat, Earl, Hilary and Chris took us over to Medicine beach to show us the views and to pop out a wine picnic on the driftwood covered beach! What a perfect way to spend a sunday! Thanks so much, Hilary and Chris, we had a blast! 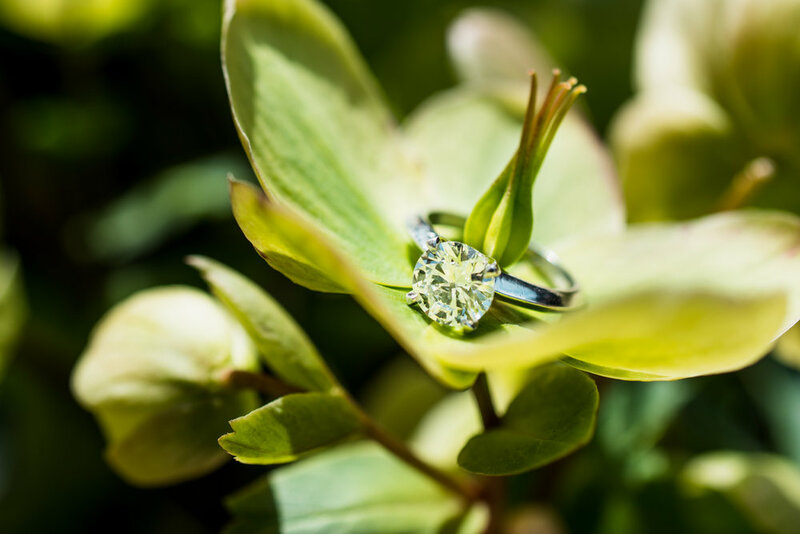 We can't wait for your May wedding in Stanley Park! 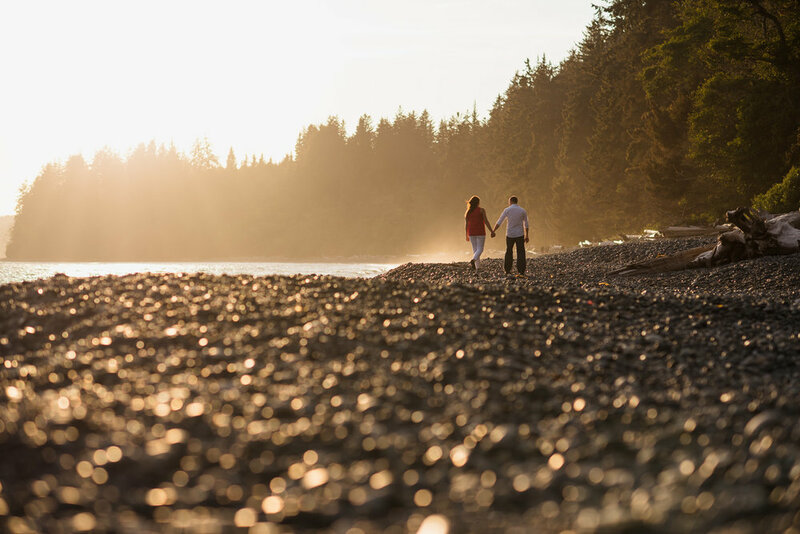 Spring is in the air, and summer is right around the corner here on Vancouver Island. We've been daydreaming about camping, building forts on the beach, waterfall hunting, and watching the sun set over the ocean. 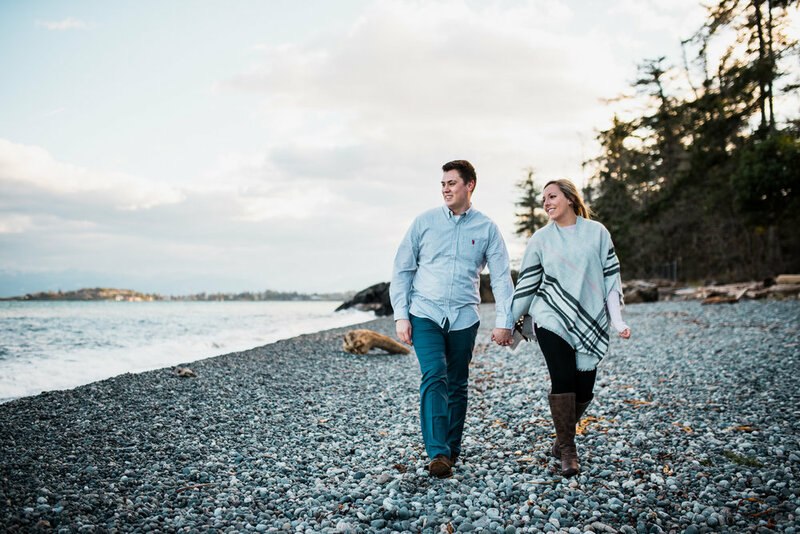 When Lynne and Brendan told us they were coming to Victoria to visit family, we decided it would be the perfect opportunity to do some fun engagement photos - and get a taste of summer in the process! Sandcut is a hidden gem of a beach with an easy trail to the beach, a waterfall that you can walk behind. Fun fact: the wall of the waterfall is riddled with shell fossils, slowly being revealed as the water carves its way though the sandstone. The wind off the ocean was chilly, but the sun was warm and dramatic over the water as we explored Sandcut. Lynne and Brendan really showed us how playful of relationship they have as they laughed, chased each other with chilly hands, outran waves, and swung from Sandcut's rope swing. All the fun and sunshine had us feeling summer lovin' for days after! Thanks Lynne and Brendan,we had a blast and we're so excited for your Yukon wedding! 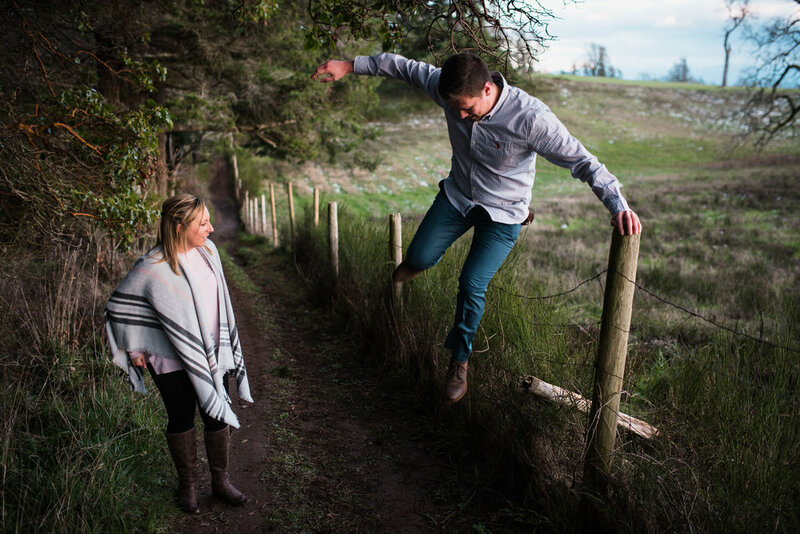 Winter and spring are often chalk full of engagement sessions for us, and we've been riding the dizzying high we've gotten as we jump from one to the next! 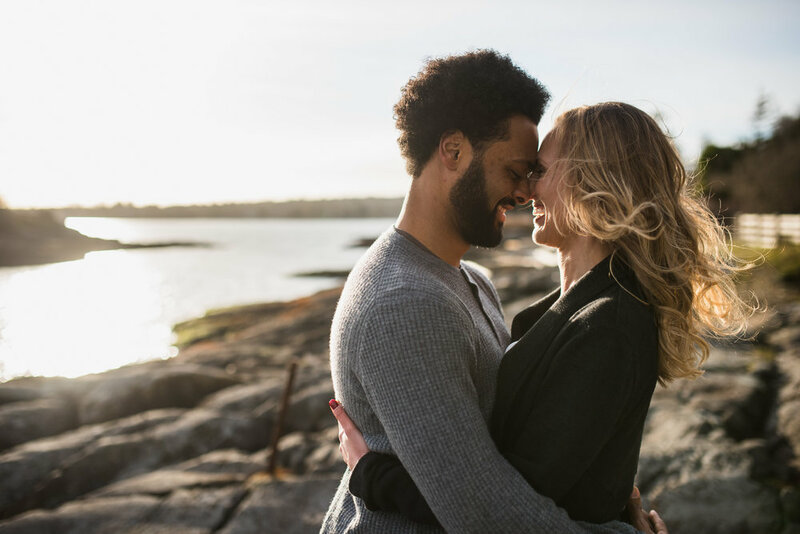 It's an exciting whirlwind for us, and a huge moment for our couples as they plan their weddings whether their wedding is quickly approaching, or over a year away! 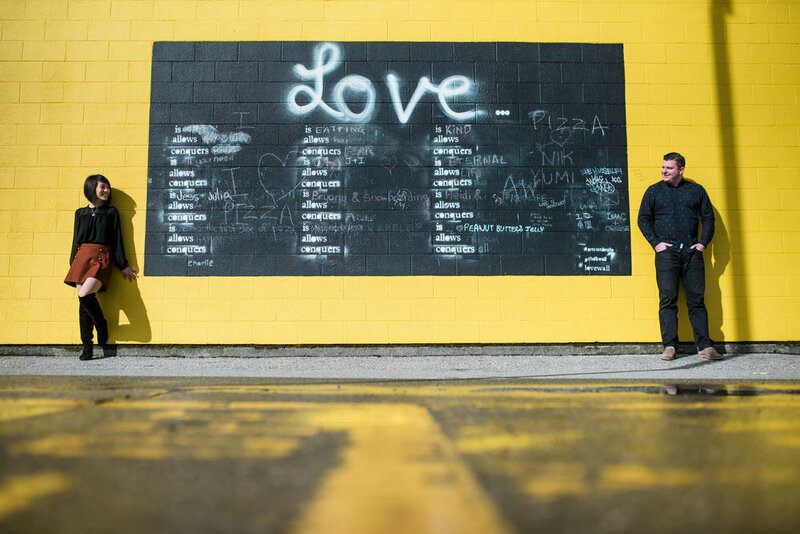 New Years Eve may seem like a long way off to some, but for Cathryn and Robert, who are hosting their Brix and Mortar wedding that day, we're sure it feels like it can't come fast enough! 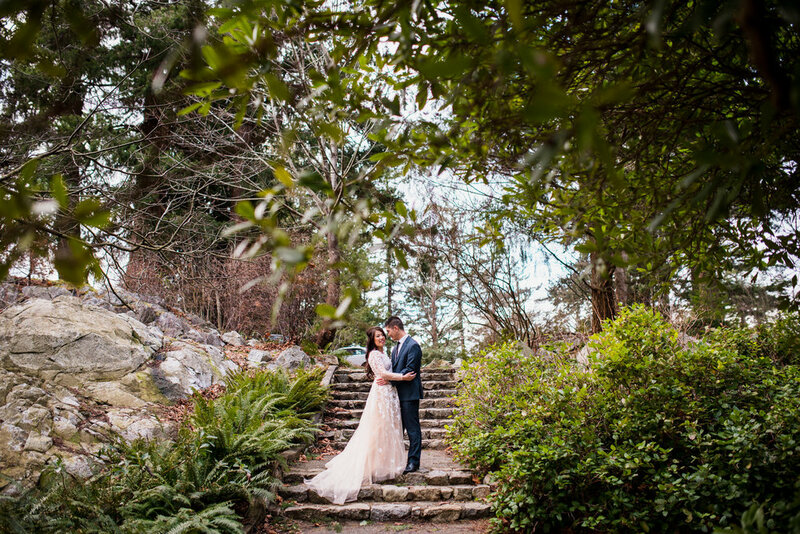 Hosting an urban wedding at one of the most unique and romantic wedding venues in downtown Vancouver, an urban engagement session seemed very fitting for the theme! What a better place to do it than right in Cathryn and Robert's hood in New Westminster! We met up with C + R on a sunny saturday evening, with clear blue skies and golden sunlight and they took us on a tour as we snapped pictures! We strolled through the brick alleyways, counted all the new and trendy cafes, and explored the boardwalk near the River Market for sunset. Vancouver in the winter months. From the east coast to the prairies, everyone knows the rumours: it rains, it pours, it clouds in with endless days of grey that stretch on for eons. Us sneaky west coasters do nothing to squash those rumours for good reason! It lets us get out and do those fun Vancouver activities without being trampled in stampedes of tourists. 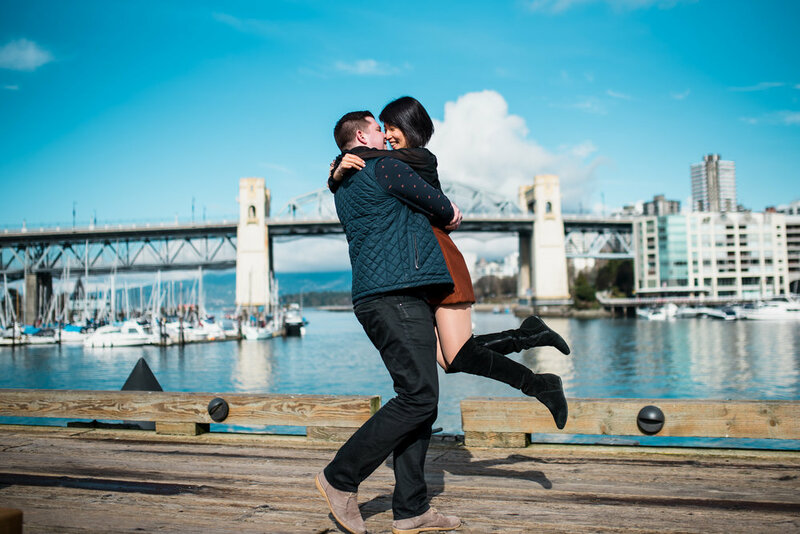 One thing to enjoy in the winter is spending a saturday morning strolling around Granville Island Market, and that's exactly what we set out todo with Lucy and Alex for their engagement photos. 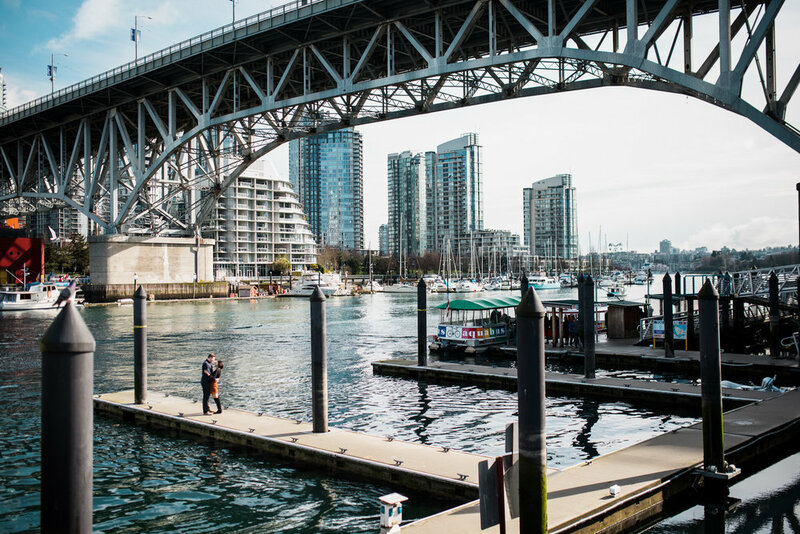 Since they live in the Olympic Village, Granville Island is a favourite local hang out for them, and we were excited to spend a morning date with them there. With sunshine and crisp air, smalls bud breaking out on the trees and a thin veil of clouds in the sky all we could feel was spring in the air. It was a perfect morning for a date! Alex and Lucy spent the morning strolling around the island, and their flirty fun was only punctuated by the puffs of misty breath between them as they laughed, and the bright colours that surrounded them and their big smiles. We can't wait to spend more time with them and their favourite people at their wedding! 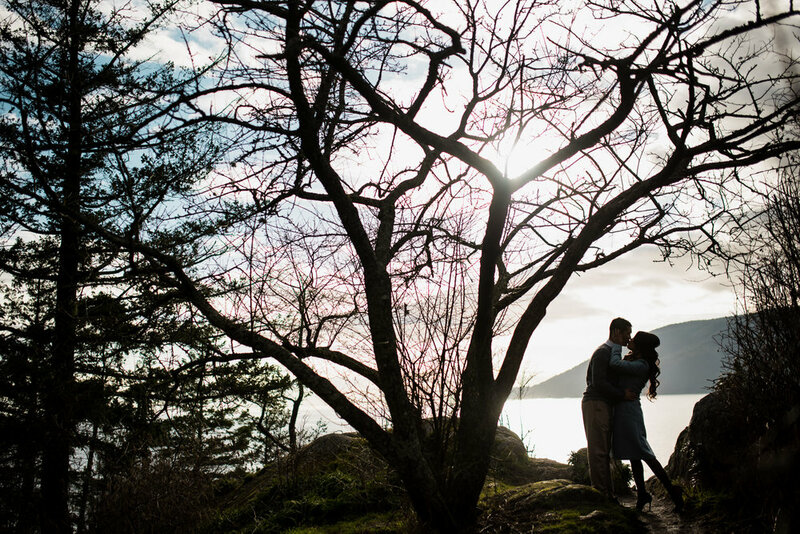 Whytecliff Park is one of Vancouver areas most popular spot for engagement photos, wedding photos, and sunset viewing, for very obvious reasons. With views of the ocean and the island, it feels like a remote escape, without having to leave the city. This time of year it seemed that we had the whole place to ourselves. This all made for a dramatic setting for Shirley and Darwin's engagement session as they explored the cliffs before enjoying a beach sunset in their formal gown and tie. 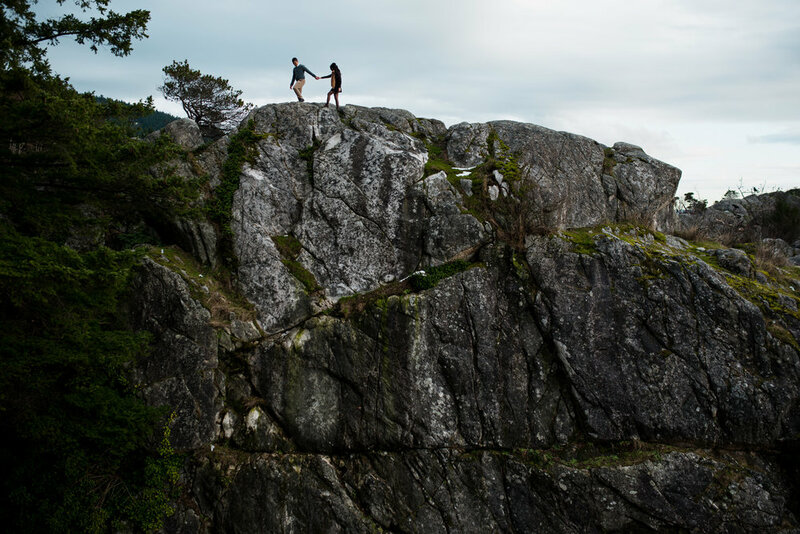 When we met Shirley and Darwin, we immediately infatuated with how sweet they were and how natural they are together as a couple, but we were blown away by how adventurous they were climbing around Whytecliff Park... in their dressed clothes! We were shaking in our own boots as we watched them navigate around the cliffs and trails looking as brave as they were stylish! CHECK OUT MORE OF OUR RECENT WORK! You know us, we love any excuse to hang out with awesome people with awesome dogs to enjoy an awesome sunset. It's even better when work involves all of the above! Jane and Nick came up to Victoria from Seattle last week to enjoy a visit with family, and we stole them away for a glorious engagement session. 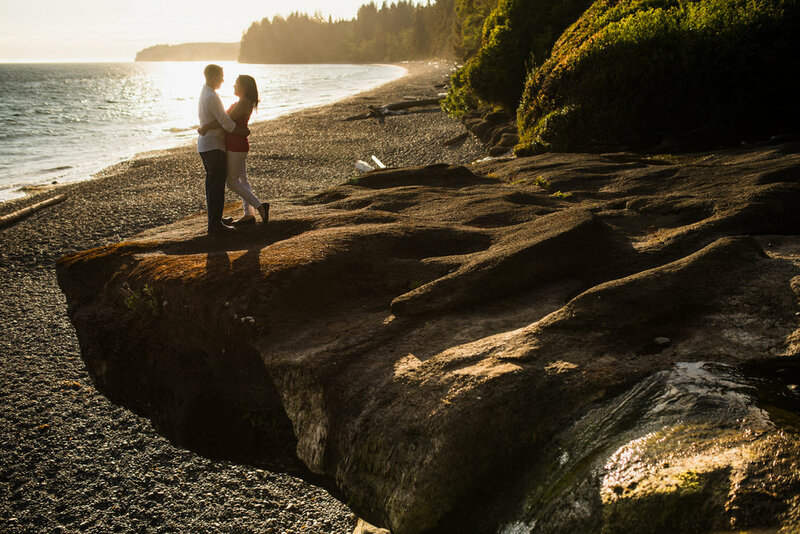 We didn't need to go far to embrace some epic Victoria vibes: we found the perfect romantic sunset setting right in the backyard! 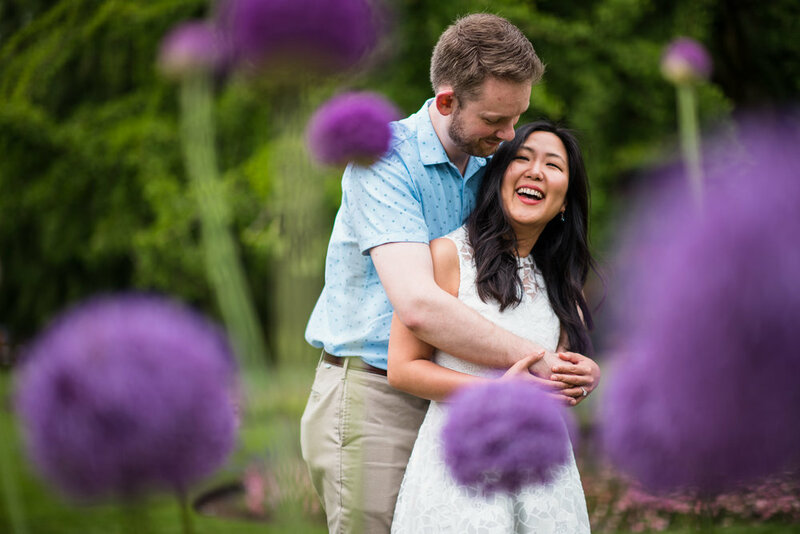 Last year we met Nick and Jane via Skype to talk about their upcoming wedding at Victoria Golf Club this year, and we couldn't wait to meet them and their pooches in person. We were greeted with huge smiles from Jane and Nick, and lots of tail wagging from Randall and Scout. After some puppy play on the lawn, we headed over to relax on the adirandack chairs for a beautiful sunset. Throughout the whole evening we were blown away by the natural, effortless connection and chemistry between Jane and Nick, and it was made all the more dramatic with the ocean breeze and warm sunset light. We can't wait to see these two get married! We've had a great taste of winter lately here in Sooke! Today brought a gentle sprinkling of snow, a few nights ago we had gail forced winter winds here in the Victoria area. 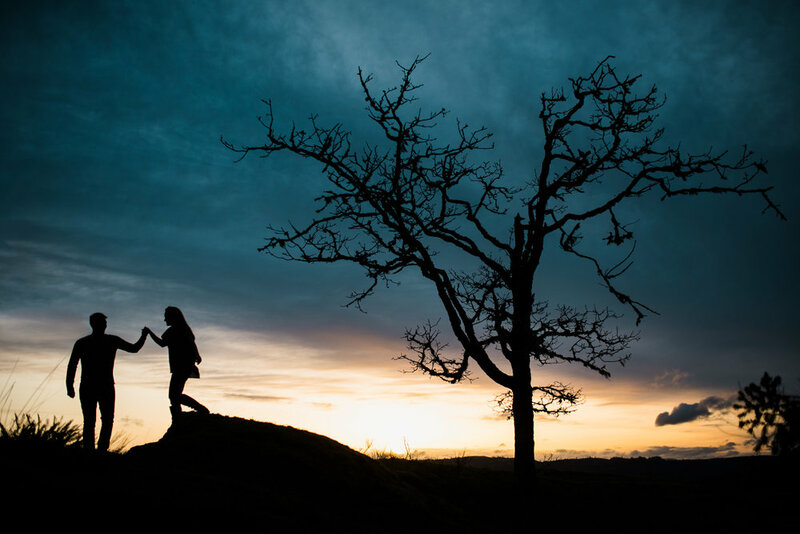 That didn't stop Cole and Kayla from venturing out for a gorgeous sunset at Devonian Regional Park during their engagement photo session! 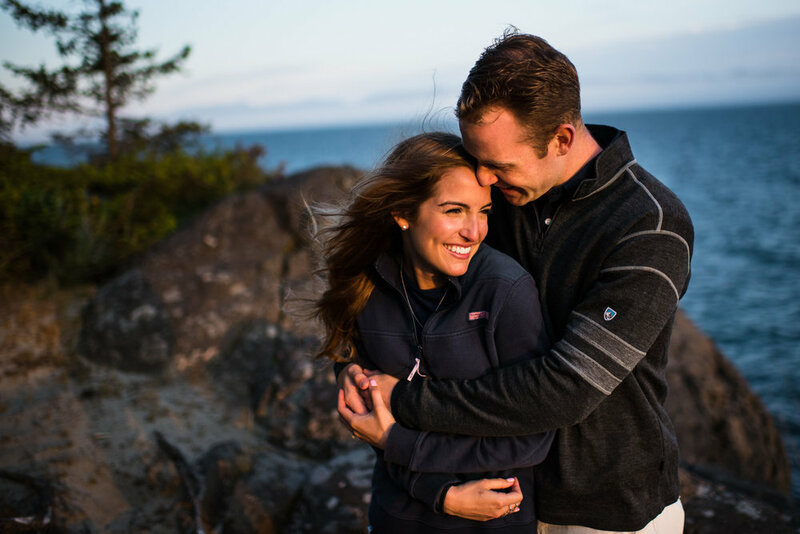 We met Kayla and Cole last year to talk about their July wedding at Prospect Lake, and we've been excited ever since! 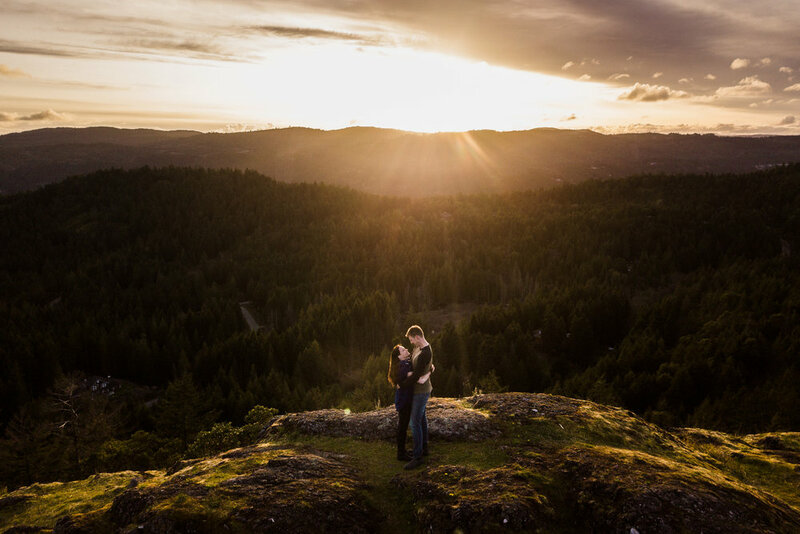 It was fun to get out and enjoy an evening with them in Metchosin for their engagement photos. 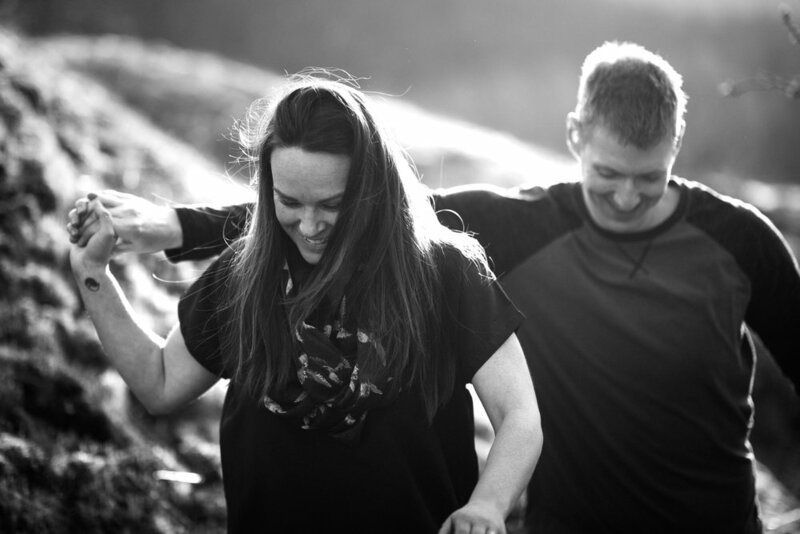 Despite the wild winter winds, Cole and Kayla were all smiles and adventure we we made our way through the woods, and made our way on to the empty beach as waves crashed upon the rocks. They even put on brave faces as we perched them on a rocky cliff to get creative and take a panorama style portrait of them, as the sun went down. CHECK OUT MORE BLOG POSTS BELOW!